Where in the world did those ancestors and folks go, when some of them left La Porte County, Indiana? Join the fun; help others find their ancestors. Here's how you do it. Type 1 to 3 paragraphs for this page stating who the ancestors were in La Porte County and where their kin went once they left here. Or you can do like George Parker did below and send us a brief biography. Our group of volunteers will also be adding some destinations in the next several months. If the search engine has brought you to this page, then hold down your ctrl and 'f' keys and a pop up box will appear. Type in the name you are looking for and hit enter. It should you to that name. Caleb B Davis, the grandfather of Arthur, was born on Feb 24,1809, in Monongalia County, Virginia, the son of John and Elizabeth (Cole) Davis, natives of that county. He came to Indiana on horseback in 1831, probably with Jacob J. Wagner of the same county. They came first to the central part of the state: not liking that area, they continued north to the land bordering Lake Michigan, soon to become La Porte County. This was more to their liking, and Jacob bought land in the area at that time. Caleb returned to his home in Virginia the same year, but he didn't forget Indiana. On December 15, 1831, he married Sarah Wagner, daughter of Jacob Wagner. A year later on December 20, 1832, a son Eugenius Wilson was born. The next year when little Eugene was old enough to travel, they left Virginia (later to become West Virginia), bound for a new home in Indiana. Arrived - La Porte County, Indiana on September 10, 1833. The first year they lived on land belonging to Sarah's father. Caleb later bought land in Springfield township, built a home and farm buildings: later a sawmill was built, and lumber manufacturing became another occupation. In February of 1838, Caleb and Sarah traded land, home and sawmill for 200 uncultivated acres of land on sections 28 and 29, in beautiful, fertile Galena township. They cleared the land, built a home and farm buildings; for forty years they raised a family and farmed the land on that place. Caleb preached in the Christian, or New Light Church, without pay. They had ten children; eight lived to maturity. They were Eugenius Wilson, Josephus, Alpheus W., Benjamin F. , Caleb B. Jr., Jacob J., Sarah E., and Hattie E. (Note, the two children that died young were: Betsy Ann dying 2 yrs of age in 1844 and Mary M being born in 1850 and dying shortly after. - Both buried on the Downing Farm Cemetery in Kankakee Twp, this county. )They moved to Mears, Oceana Co., Michigan, in 1879; some of their family settled there. Sarah died there in 1888 at the age of 76. Caleb remarried to Hannah Critchet; little is known of this event. Caleb continued to preach until his death in 1891, at the age of 83 years. Eldest son of Sarah and Caleb, Eugenius, was the only one not born in La Porte County. He attended school in a one room log cabin, but only in the winter months when he wasn't needed for work on the farm. Being the eldest of a large family meant extra responsibility for Eugene. When he was seventeen, he continued his education on his own, studying when he could find time. When he was considered qualified to teach, he was hired in an area rural school where he taught for several years. He preferred farming and fruit growing, but continued to teach school in the winter months for ten years. His first land purchase was eighty acres in Galena township for 700 dollars. Orlando was born on 21 Oct 1852 in Springfield, La Porte, Indiana, the oldest of 9 children born to Henry B Harrington and Rosilla Ann Bentley. Orlando lived in Springfield from the time of his birth through the time of his marriage on 11 Feb 1882 to Amanda Mahala Ray. Amanda was the youngest daughter of Joseph and Elmira Ray, and was born in Kosciusko County, Indiana and raised in Marshall County, Indiana. They had a total of five children, although two did not survive childhood and their names are unknown. Their three surviving children were Pearl Mae (married William Henry Oak 21 Dec 1901 in La Porte, IN), Rozilla Ann (married Frank E Ray 20 Jun 1905 in Berrien, Michigan) and Sylvia Ruth (married Oscar Palmer Guthu 25 Dec 1913 in Rye Gate, Montana). By 1900, the family had moved from Springfield to Galena, and in 1910 they were found in Miles, Custer, Montana. 1920 found them in Musselshell, Montana, and by 1930 they were in Pleasant Home, Clackamas, Oregon. Orlando passed away on 11 Feb 1941 in Sandy, Clackamas, Oregon. His wife followed him on 25 Sep 1942, also in Sandy. Pearl and William Oak also moved with the family to Montana, and then to Oregon. Pearl passed away on 10 Jan 1976 in Gresham, Multnomah, Oregon (about 15 minutes from Sandy). William died in 1951. They have descendants still living in the greater Portland, Oregon area today. Rozilla and Frank also made the move to Montana, and there they stayed. Rozilla died on 22 Jan 1965 in Deer Lodge, Montana. Sylvia and Oscar Guthu married in Montana, and then moved to Oregon. Oscar died 13 May 1964 in Sandy, Clackamas, Oregon. Sylvia, known to me as Grandma GG, passed away 5 July 1987 also in Sandy, Clackamas, Oregon. Of their 6 children, 2 are still living - Rosetta Mae "Dot" lives in Southern Oregon and my grandmother, Helen (Guthu) Loundree lives in Sandy, Oregon. Nathan Kimball appears in the 1840 census with the surname being spelled as Kimble. He and his wife are between the ages of 30 and 40 on the report and there are several children listed. (Mehan) - Catherine (Kaupke) Peterson Mehan. - Born in 1903 and celebrating her 105th birthday out in Arizona where she is living after moving there from LaPorte County. What is her name? Catherine (Kaupke) Peterson Mehan. Her parents were Louis L and Lydia (Linton) Kaupke who were married Pulaski County, Indiana. Catherine graduated from Rolling Prairie High School in 1921. She married Carl O Peterson in LaPorte County 15 June 1926. Her current name is Catherine Mehan (second marriage). She lived in La Porte for 69 years, moving to Arizona in 1978. She taught home economics and grade school for 10 years in La Porte. Her husband, Carl, owned a sheet-metal and heating business where she also worked. She has a daughter, Barbara (Peterson) Lachapelle, 77, who lives in Florida. Catherine currently lives in the Sierra Winds retirement community in Peoria, AZ. Thank you Robert Mickelson for sending us much of this information. Thomas McCartney was born about 1809 in Ohio, probably in Springfield, Clark County. He was one of 12 children of judge, farmer, miller and land speculator William C. McCartney and his wife Margery. On 2 Apr 1811, William McCartney, Sr., a miller, is elected as an Overseer of the Poor for the Springfield, Ohio, area. And in 1814, William was the largest donor toward the building of a 40x30' meeting house for the Methodist Episcopal Church in Springfield, Clark, Ohio. In the 1830 census, the William C. McCartney family lives in Union, Logan, Ohio, near West Liberty, where William McCartney is again a miller. On 23 May 1830, Thomas McCartney married Christena Newell in Logan Co., Ohio. They were married by Jeremiah Fuson. Christena, born about 1811 in Ohio, was likely the daughter of William and Elizabeth (Shields) Newell of Logan Co., Ohio. Shortly after his marriage, Thomas moved with his parents and most of his siblings to the South Bend, St. Joseph, IN, region where all of his known children were born. Thomas’ son William W. McCartney was born in Indiana about 1831. His daughter Amanda M. McCartney was born there about 1835 and his daughter Josephine A. McCartney was born there about 1838. On the 1840 census, Thomas McCartney, with his wife and three children, lived in LaPorte County, IN. The family owned land in LaPorte, Elkhart and St. Joseph counties. On 13 Jan 1845, Thomas McCartney, his father William C. McCartney and his brother in law Elisha Egbert were among the incorporators of the Philadelphia Industrial Association in South Bend. In late February or early March of 1849, it appears that Thomas left South Bend for the California gold fields with his brothers James and Benjamin. Indications are that James returned to South Bend fairly quickly and resumed farming. Benjamin seems to have done well in California and apparently returned to South Bend, via Panama, in late 1852 or early 1853, after the death of their father on 30 Jul 1852. On the census of 10 Sep 1850, Thomas’ wife and three children live in German township, St. Joseph, IN, just north of South Bend. While it was reported by the census that Thomas was in the household. It seems likely he was actually in California. Also listed in his household were Lewis Barr, age 19, born in Pennsylvania and Wm. H. Ward , age 22, born in Ohio. These men are both listed as farmers and are likely farm hands left to fill in for Thomas. On 12 May 1852, Thomas was living near Sacramento, CA, when he gave a Power of Attorney to William Miller of St. Joseph Co., IN. This could be the result of the death of his wife Christena, as there would have been no one in Indiana to direct his financial affairs. On 20 Jul 1860, Thomas is living in household 1027 as a farmer in Michigan Bar, Cosumnes, Sacramento, CA. Michigan Bar was a gold rush town about 25 miles east-southeast of Sacramento along the Cosumnes River. 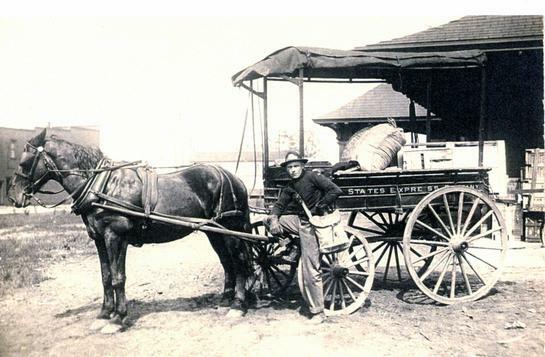 The Michigan Bar post office was established in 1855 and discontinued in 1935. As a town, it no longer exists; however a historical marker is located there. Living with him are his son William McCartney and a farm laborer, Louis Barr, 28. Louis seems likely to be the same farm hand that worked for the family in South Bend in 1850, though his reported place of birth has changed from Pennsylvania to Ohio. Based on marriage records from Sacramento, it appears that Thomas’ daughter Josephine McCartney also moved west and married a Frank Bailey, who was born about 1830 in Maryland. The couple lives near to Thomas in household 777, Michigan Bar, Cosumnes, Sacramento, CA, and has a daughter named Emma Bailey, born 1859 in California. The couple was married on 19 May 1859 at the Sebastopol mining camp, Sacramento Co., CA. Living with Frank and Josephine Bailey is B.F. [Benjamin Franklin] McCartney, the son of Thomas’ brother Nathaniel McCartney and his wife Abigail M (Parker) McCartney. Nathaniel, also a miller, had died of consumption/TB on 7 Jun 1856 in Scio, Linn, Ore., and his widow had moved to Chico Twp, Butte, CA, perhaps to be near Thomas. On 18 Jun 1860, Nathaniel’s widow Abigail is living in household 189, Chico, Butte, CA. Benjamin is also listed as living in her household along with his siblings, a double count. It appears that Thomas McCartney died near Sacramento, CA, of consumption/TB about 1861. On 10 Aug 1864, his son William McCartney of Sacramento Co., CA, sold Thomas’ ranch to William Dugan of El Dorado Co., CA, for $1,250. It is described as a parcel of land of one hundred and sixty acres and buildings in Sacramento Co. It was composed of “the undivided half of the Eastern or upper half & the entire tract bounded on the north by the Consumes River; on the east by the ranch known as Sheldon’s Ranch; on the south by the high-lands or hills; and on the west by Wilson’s Ranch. On 17 Mar 1867, William McCartney appeared before E.D. Shirland, the Sacramento County Clerk, to record the deed, above, at the request of William Dugan. There is no further record of Thomas’ son William W. McCartney, or his daughters Amanda M. McCartney and Josephine (McCartney) Bailey. No solid record has been found of his granddaughter Emma Bailey. Benjamin Franklin McCartney is last mentioned in his mother’s probate notice, which was filed on 31 Mar 1864. The answer to what happened to some of them may be in the probate archives of St. Joseph Co., IN, as it would have been necessary for the county to arrange for the proper disposal of Thomas McCartney’s assets, which were located there. Mr Augustus Schausten married Augusta Groehler in 1860. He was from Hermeskeil, Germany (Prussia) and was at one time the proprietor of the St. Nicholas Hotel in Michigan City. That building is still extant - it's located at 418 & 420 Franklin Street. He apparently ran for town sheriff and lost in the late 1870s. From all the research I've done on his family I found no living relatives. Added web master notes: Augustus was the son of Nikolaus Schausten and brother of Herman Schausten how enlisted in the Civil War. Both brothers moved to Washington DC in the 1880's. Nelson F. Ward and Marsilva (aka Sylvia or Mersylvia) Concannon (She being the daugher of James and Sarah Concannon) were united in marriage in LaPorte County, IN on 12 June 1862. The remained in Wanatah and appear there in the 1870 census, he as a Physician and Marsillva (sp) as keeping house. Her sister Elizabeth Concannon is living with them and teaching school. She is 29 years of age. In the 1880 census, we still find them in Wanatah area and now they have an 8 years old daughter, named, Edith Gracie - born July of 187?. Marsilva is now also practicing as a doctor. By1885 they have moved on to Wysies Village, Butler County, NE and can be found there in the state census. By the time the 1900 Federal Census is taken, Both Nelson and his wife are living in Turkey Creek, Franklin County, Nebraska and are boarding, they are both physicians. Mrs. Ward reports that she has had 3 children, one of which (Edith Gracie) is the only one that survives. Edith marries a Frank Barrows (born in Missouri in September of 1871) he is shown as a painter and she a physician. In the 1900 census, they are living in Wyandotte County, KS. By the 1910 census, Edith Shows she and her daughter living in Sheridan County, Wyoming, she stated that she has been married for 18 years; but Frank is not with them in this census. Mr and Mrs. Nelson are living in the Big Horn County of WY in the 1910 census. IN 1920 Nelson is widowed and living in the same county . He is 83 years of age and in this census, Edith Grace, just uses her middle name of Grace Barrow. She is divorced and 44 years of age. Her daughter Corrine ? Barrow Sharp shows that she is married and living with them. She is 18 years of age and states she was born in Nebraska. Found Dead in Chicago, August Johnson, of Pinhook, near Westville, recently disappeared, leaving no trace of his whereabouts. Advices received from Chacago say that the body of a man supposed to be Johnson is at a morgue in that city awaiting further identification. Antone Boeckling and his family lived in Michigan City, Indiana. Antone wife, Elizabeth Schmidt Boeckling, is buried in Greenwood Cemetery as is he, after his death (8 Feb 1917) he was brought back to Indiana for burial. Antone and Elizabeth were wed in LaPorte Co., IN 10 Aug 1861. After his wife's death, Atone went to Marion Co, Indiana and then on to Sandusky, Erie County, OH where we also find his eldest son, George A. Boekling. G. A. Beckling - "Born to German immigrants in Indiana in 1862, George A. Boeckling was a salesman and real estate agent. In 1897 he became general manger of the newly formed Cedar Point Pleasure Resort Company. Under Boeckling’s leadership, Cedar Point was transformed from a summer picnic area to a thriving amusement park with wide appeal." Per the June 2007 Sandusky Blog Spot. Drop by the Sandusky Library either via the Internet or in person. Francis, his wife, later died on 15 July 1895 in Indianapolis, IN at age 75. Of the children, Richard W, became a minister and eventually went to Montana. John N, went to Elkhart, Frances married a Johnston, Carrie R married Francies T. Holliday, and May E. married Edwin J Swan. Elias and Phoebe had one daughter Elizabeth in about 1854-55 while still living in Indiana. They then packed up and went to Lockwin, Brown County, Kansas. Known children born in Kansas were Joseph born the 24th of October, 1857, Ira born in about 1860 would later go to Adams County, Nebraska; John Wm b abt 1866, Daniel 1864 and George .Then the family moved on to Cedar County, Missouri where Mary A, was born Mar 24, 1868. Elias came back to LaPorte County sometime before Hal was born about 1873. Then Ella and Belle joined the family too. Mary would marry Oscar Chambers and remain in LaPorte County. Ella married a Horatio Koontz , they lived in Elkhart Co., IN. And Belle married Jessie Holderman and went to St. Joseph County, IN. Please note the obituaries we have on line for some of these descendants. Click on Photo for larger image. - Kannard or Kennard, Perry - Perry first married Margaret A. Mathews/ Mathis on 29 November 1852. They were evidently divorced in Kansas and Margaret than married a Joshua Dunnuck and her son Pearl Elvis Kannard of 6 (actually born 1872) is living with them. Later Pearl changed his name to Dunnuck. Perry Kannard AKA Kennard enlisted as a Pvt on 15 December 1863. He enlisted into Co. A, 12 Cav Regiment Indiana Dec 15, 1863 MO Co A, 12 Cav. Regiment Ind on Nov 10, 1865 in Indianapolis, IN. His occupation was listed as that of a Farrier. Eli Lightfoot was born in Ohio 21 Aug, 1815. Eli arrived in the LaPorte Co., Indiana and Berrien County, Michigan area in the mid 1840's. With him was his wife Ruth and several children. Ruth died sometime after 1849 when Prudence was born. Eli then married Harriet Smith 26 Mar 1861 in this county. Margaret b. 1835 and m. George Row, she died young and is buried in Rolling Prairie Cemetery, Rolling Prairie, Indiana. Rebbecca J b. about 1837 m. Elijah Qualls 1861 in Berrien Co., MI. Simeon b. about 1842 m. Nancy A. Hawley. Simeon served in the Civil War. Annonius(sp) he was born about 1845. Malinda b. about 1847 m. Justice Hale 15 Nov 1862 In LaPorte County. Prudence about 1849. She married William F. Smith and went to Iowa. After the death of Ruth - Eli married Harriet Smith and they had 3 recorded children. They headed to Marshall County Indiana where Edward and Gilbert were born. Then they must have traveled on through Missouri where Ada (Adeline) was born in abt 1873. Harriet can be found living as a widow in the Dakota territory in the 1880 census. She is a widow. Some of the family members listed above returned to the Berrien County and LaPorte County area after trying their luck out West. Smith , Charles Edward - Charles Edward Smith is my second great grandfather. His parents were Charles Edward Smith (21 Jul 1801) and Jane Usher (15 Mar 1814). He was born 12 May 1836 in Indiana. We believe it was Clinton County since that was the location of his parents’ marriage in 1831. He was the second of seven children, six boys and one girl. Joseph H Smith (1833-1896) was the oldest followed by Charles. After Charles, the only girl Martha Ann Smith (1839-?) was born. The four remaining boys were John Wesley Smith, Sr. (1842-1914), Alonzo Lonson E Smith (1845-1909), James Smith (1849-?) and finally George Smith (1853-?). By the 1850 Census (27 Aug 1850), the family had moved to Oregon Township, Starke County, Indiana. This township centerpoint [N1] is Latitude 41.3900434 (41� 23' 24.2" N), Longitude -86.5277904 (86� 31' 40" W). Even in the current day, the area is still a very rural setting. The census that year asked for the occupation of males over the age of 15. Since Charles was only 14, there was no response for him. However, his father and older brother listed their occupations as farmer. The value provided for the real estate that his father owned was given as $1500. That value converted [N2] to 2010 dollars equals $37,500 although farm land value may not necessarily be reflected by a straight conversion. His father died in 1859 and his older brother had moved out according to the 1860 census (7 Jun 1860). At that time Charles was the oldest male. Also in the household were his mother Jane who would die a few months later and younger brothers Alonzo and George. So far I haven’t been able to find out what happened to the other siblings by 1860 although I do know that Joe and John married in 1864 and 1863, respectively. Charles, his mother and younger brothers were living in Pleasant Township, LaPorte County, Indiana to the northeast of Starke County. The 1860 census asked for the occupation of males and females over the age of 15 and the value of the real estate or personal estate owned. Charles and his brother were listed as farmers. His mother’s real estate value was $2000 and personal estate was $400 where Charles had $50 personal estate. His mother’s land value would be equal [N3] to $52600 and her personal estate worth $7900 in 2020 dollars. He had personal items valued [N4] at $1300 in 2010 dollars. I need to research what happened to the estate of his father. His mother Jane Usher Smith died on 31 Aug 1860 and is buried in the Oak Grove Cemetery, Wills Township, LaPorte County, Indiana. The cemetery is located near the intersection of N600 E and E50 N. She is buried [N5] in Lot 308, grave 6 in the old burial area. There’s an Edward Smith buried in the same lot , grave two but the website that has the cemetery listing shows a death date of 14 Jul 1869 rather than 14 Jul 1859. Charles, my 2x great grandfather, married twice. His first wife was Mary Brunson (1842-1874). They married either 23 Jan or Jun 1861 according to family trees on www.ancestry.com but neither date has any source cited. Charles and his family had moved to Osceola Township, St. Clair County, Missouri by the 1870 ( 7 Jul 1870) census. His first two daughters by Mary were born in Indiana and the last was born in Missouri. The girls were Charity Ann Smith (17 Mar 1862 – 9 Jan 1935), Margaret Jane Smith (13 Dec 1866-?) and Bertha Hephzibah Smith (19 Jan 1870-?). The census does not show Charles as owning real estate but he is performing farm work as an occupation. His personal assets are valued at $310 or $5200 in 2010 dollars - From Joyce. The Sovereign family groups migrated to the US and then some went up to Canada . It is interesting to note that both Abram and Rufus, respond in the 1880 census, that their parents were born in New Jersey and themselves in Canada. There appears to be 4 main households of Sovereigns that came to LaPorte County, some as early as the 1841. Because of proximity, I believe that Rufus, William and Abram Sovereign were brothers. But Lewis Sovereign, the doctor, comes from Canada and then lives in Elkhart Co., Indiana. In later years he moves to LaPorte County and Illinois and is buried in Greenwood Cemetery, this county. Berrien County has a history on Lewis and his son, therefore we won't repeat it here. Abram Sovereign - First appears in the 1850 LaPorte Co., Indiana Fed. Census. He married Annis, the widow of Horace B. Hibbard who died in LaPorte Co., IN about 1838. Abram & Annis were married in Berrien Co., Michigan 21 Jan 1841. Abram and Annis (b. 1804 in CT) must have divorced. Abraham married Eunice (Tabor) Pitcher in La Porte Co., IN 29 March 1865. Eunice Tabor was previously married to Alonzo Pitcher who was died in Chattanooga, Tennessee 11 Oct 1863. Alonzo and Eunice had one child, Chester Ellery. Abram and family can be found in the 1870 census in Caldwell Co., Missouri where he moved. They have small children in the household. In the 1880 census and the copy I was able to obtain, the census page has been pasted with the wrong given names. But if you look in Caldwell County, Missouri, you will find Abram along with his age, wife's age and age of two older children on the previous page where Nellie Sovereign and other siblings born in the 1870's are listed along with a step-son, Ellery Pitcher - stepson. Abram died 2 June 1899 and is buried in Hume Cemetery., Hume, Bates County, MO. Age at death was 79 yrs, 1 mo 12 days. William Sovereign - Born about 1826 in Canada. He married Sarah. There appears to be some romanticism involved in the family lore here. William and Sarah had 6 children and in the 1900 census, Sarah states that 4 of the 6 children she gave birth to are living. In 1850 William is living with brother Abram Sovereign. In 1860 William is now married to Sarah and they are living in the New Durham, Westville area in Laporte County. William states on the census that Abram and Jane are both b. Indiana. It is possible that William did return to Canada, for whatever reason and then returned to Indiana with his wife and young children. But the conflict comes in the fact that for two census the children are shown as being born in Indiana. Then after William's death in Jefferson County, Iowa 19 Mar 1865, Sarah responds to the census that the children are all born in Canada. Sarah married Ichabod Richmond after William had been killed when struck and killed by lightening. Four of their children were Abram, Francis Jane. (who married Merlin Sparks) Mary E., and Emma O. who was deaf and mute. William's son, Abram, married Ella A Sherman in Knox Co., NE 22 Sep 1878 and later moved to Antelope Co., NE. They all lived in Nebraska for most of their lives. Rufus Sovereign - Of the other 3 Sovereign family groups, Rufus Sovereign, born in Canada 10 July 1828, was the only one to remain in Indiana. He lived in New Durham Township, LaPorte County and just across the line into Jackson Twp, Porter Co., Indiana. He married Nancy Rogers on 6 October 1851, she being born Kentucky 11 Mar 1830. They are both buried in Westville Cemetery this county. Leander b. 6 Mar 1855) went to Arkansas where he married in 1893. Bertha married William Lahayn and lived most of her life in Porter Co., Ind. She died 1945. William P. Wedge (born 1810 NY) is on the 1860 Census of New Durham Township, Laporte Couunty, Indiana, with his wife Annis and child Rosa (Rosella Elizabeth). Neighboring family is his son Ezra Bates Wedge and wife Mary Elizabeth Michaels. They lived in Pierpont, Ashtabula County, Ohio in 1850. Ezra died in the Civil War at Wanatah on 13 January 1864 at his fathers house. His wife lived in Winfield, Lake County, Indiana at that time. Mary Elizabeth Wedge remarried a Moses Cooper, she is again widowed on the 1880 census of Porter County Indiana. William P. Wedge and Annis moved to Eaglesville, Harrison County, Missouri and is listed as a Minister on the 1870 Census there. William and Annis both died in Harrison County Missour in the 1870's. Rosella Elizabeth Wedge married Jesse Carter and died at Platsburg, Missouri. Farmer, section 13, - - was born in Wayne County, Ind., Nov. 3, 1929. His parents were John and Katherine (Brown) Whitehead, the former a native of North Carolina, and the latter of Kentucky. They removed to La Porte County, Ind., in 1842, where the father soon after died. After a number of years Mrs. Whitehead, while visiting her daughter in Delaware County, Iowa, also died. G. H., our subject, was educated in the common schools of La Porte County, Ind., and after his father's death he managed the farm. In 1851 he was married to Ann M. Kellogg, a native of Ohio, and a daughter of Harvey and Jerusha (Parks) Kellogg. In the fall of 1854 he removed to Floyd County, where he located in St. Charles Township. He owns a fine farm of 127 acres of land, on the edge of Charles City. Mr. Whitehead has been from the first establishment of the Baptist church of Charles City an earnest supporter thereof. Politically he is a Republican. You will also find this family in the 1850 Census George's mother Katherine Brown Whitehead is found in 1860 census for Oneida, Delaware Co, Iowa living with her daughter Mary and her husband Jasper Hunt. I see that there is considerable information on the Hunt family on your site. His father's grave should be found in LaPorte County. - Contributed by" Dennis Lawrence. Woodin, Peter - Peter Woodin originated from Oswego County, New York. He was born there 20 Aug 1804 and was probably the son of Amos Woodin. In the 1830 census he and his new bride, Margaret Bias or Bials, can be found in Panama, Washtenaw, Michigan Territory, where two of his daughters, Sally M. and Helen M are born. And by 1837 Peter and family are in Starke County, Indiana, in the portion of the county which will be later known as Van Buren and then incorporated into Cass Township, LaPorte County, Indiana. At least three more children were born, Charles M, born 1839, Emily May 1843 and Peter Eudorous born December 1847. Helen M Wooden m. Charles M Rowley after the death of Charles Rowley. She married Zephaniah T. Horine 25 June 1870 and they later divorced. He went to Kansas and she stayed in La Porte County. Helen had two children, Daniel and Noah Rowley. Both are buried in Hanna Cemetery, as is she under her married name of Rowley. Emily first married Chandler Palmer. She then married Lewis Howland and she d. Feb 1936 in Grand Isle, NE. KRUSEMARCK - Chicago Daily Tribune, Chicago, IL 30 Dec 1928 Obituary KRUSEMARCK--Dr. Charles Krusemarck, aged 74, Dec. 18, at his home in La Porte, Ind. Beloved husband of Ida M., fond father of the late Charles and Orville Krusemarck and Herbert of La Porte, Ind. Services Monday, 2 p.m. from chapel, 124 E. 22d-st. Internment Oakwoods cemetery. Los Angeles papers please copy. Damon Gray - 1918-08-01 Chicago Tribune (IL) AMERICAN OVERSEAS CASUALTIES ARMY CASUALTIES Edition: Chicago Tribune WASHINGTON, D. C., July St.--Today's casualty list of the American army in France contained 194 names, bringing the total overseas army casualties to 12,522. DIED OF WOUNDS. LIEUTENANTS. Damon Gray, La Porte, Ind.